A controversial natural gas pipeline is set to run through Southwest Georgia this summer, but will it bring jobs and energy to the region? 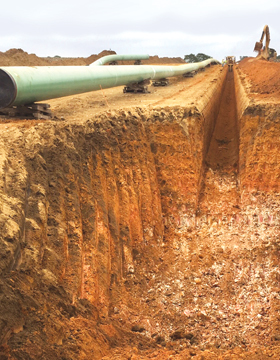 Photo credit: Spectra Energy Corp.
Energy Diversity: The Sabal Trail natural gas pipeline in Stewart County. Southwest Georgia, one of the poorest regions in the state, is sitting – literally – on a new project that, while controversial, could in the long run have a positive economic impact on the entire area. The 515-mile Sabal Trail natural gas pipeline, which starts in Alabama, will run through nine South Georgia counties before heading to Florida. Company officials expect the gas to begin flowing in June, several years after Sabal Trail Transmission, a joint venture of Spectra Energy Corp. of Houston, NextEra Energy Inc. of Florida and Duke Energy, won the right to build it. Pipelines carrying everything from water to petroleum and natural gas have been around for decades, creating what’s been likened to an interstate highway system underground, and have generated controversy that continues today. Hundreds of people, for example, have been trying to stop construction of the Dakota Access Pipeline, a 1,172-mile-long pipeline running through North and South Dakota, Iowa and Illinois. That pipeline, however, is an oil, not natural gas, pipeline – a significant difference – and one of the most important reasons the out-of-state company surmounted all opposition in winning the right to build the $3.2-billion Sabal Trail pipeline through Georgia. The company points out that the pipeline will increase the diversity and reliability of Southeastern energy markets as Florida energy companies seek to shutter coal-fired energy plants and replace them with clean-burning natural gas. And while it is true that up front none of the gas is going to Georgia – it will be delivered to Florida Power and Light and Duke Energy of Florida customers – that’s a circumstance that could change and bring great benefit to the area. In fact, the project, which officially got underway in late August, is already having a major economic impact on the Peach State, says Andrea Grover, director of stakeholder outreach for Sabal Trail Transmission LLC. In addition, the company says the pipeline will generate 1,856 construction jobs and almost $58 million in labor income for the state. Once completed, the pipeline will create 145 permanent jobs and about $6 million in annual funds from jobs in Georgia. While these numbers are significant, it’s the future that offers up an opportunity for a long-term impact on the region’s economy. The company has located taps at four spots along the pipeline in Georgia, which will allow utilities to connect and distribute natural gas to local communities – which, in turn, would make it possible to recruit manufacturing or warehousing/distribution operations that require greater access to the less expensive, cleaner-burning fuel. “We have our anchor customers in Florida, but as we started working with the municipalities and the counties in Georgia, we were able to work with them on four different taps,” Grover says. Two taps went into Dougherty County, one in Colquitt County and one in Mitchell County, she says. Opponents say the pipeline is a bad deal for the state, local communities and the environment. Mark Woodall, chair of the Sierra Club’s legislative committee in Georgia, says the pipeline is an environmental threat and goes against prevailing energy trends. While the argument can certainly be made for renewables, natural gas in many minds represents a more environmentally friendly choice than coal or oil. It is cleaner, abundant and today is less expensive and more scalable than solar or wind. As for the benefit to Georgians, Grover tells of a similar pipeline her company ran from Canada to Massachusetts, passing through Maine and New Hampshire and starting service in 1999. Taps were installed along the pipeline, and today Maine takes more than 50 percent of the natural gas that flows through the pipeline. Gloria Gaines, a Dougherty County Commissioner who represents a section of Albany where the pipeline will run, doesn’t buy that argument and says it will hurt her constituents. “We see ourselves getting all the negative impacts and none of the benefits,” she says. So, how did the project get the go-ahead anyway? Jack Belcher, executive vice president at HBW Resources LLC, a consulting firm that works with energy clients but was not involved in the Sabal Trail project, says many factors are involved in energy projects that cross state lines. The Federal Energy Regulatory Commission (FERC), which green-lighted Sabal Trail, makes decisions based on a range of “national interests” that may outweigh the most vehement local or state arguments against a project, he says. Those interests include economic impact and long-range energy needs. Belcher says pipeline projects get more attention than in the past because so much attention is being paid to hydrocarbon-based energy. For a time, pipeline opponents had hope of stopping Sabal Trail. The Environmental Protection Agency raised concerns about the project, saying it would run through areas prone to sinkholes and posed potential dangers to the Albany water system, wetlands and the underground Floridan Aquifer. The agency recommended the pipeline be rerouted. The Georgia House of Representatives also voted down a bill that would have granted easements for the pipeline through southwest Georgia. The easements were needed to build the pipeline under several rivers, including the Flint and the Chattahoochee. U.S. Reps. Sanford Bishop, John Lewis, Hank Johnson and David Scott sent a joint letter to FERC raising the issue of environmental justice in Albany. “The proposed industrial compressor station facility would sit right in the middle of an African-American residential neighborhood comprised of two large subdivisions, a mobile home park, schools, recreational facilities and the 5,000-plus member Mount Zion Baptist Church, a predominantly African-American congregation,” they wrote. Dougherty County approved a resolution opposing the pipeline, as did Lowndes County and the cities of Albany and Valdosta. But things turned around for the pipeline. In December 2015, the EPA dropped its opposition after receiving new information from the pipeline company. The EPA says the company agreed to shrink its right-of-way through wetlands areas, reroute the pipeline in places and use techniques to minimize the chances of ruptures. Ultimately, FERC signed off on the pipeline, overruling the state House. Woodall says the FERC permit gave the private, out-of-state company the power of eminent domain. Harry James, Gaines’ predecessor on the county commission, says the pipeline proponents were too strong and well financed. “We just got rolled over,” he says. Grover says the company sent employees into the field to meet with landowners and understand their concerns. “We had agreements with 90 percent or more of the landowners on the entire 515 miles,” Grover says. Sabal Trail Transmission is trying to be a good neighbor, she says. It will set up scholarships at community colleges and is donating money to local organizations, Grover says. The Dougherty County Library system, for instance, received $27,000. Grover says pipeline leaders held numerous public hearings and community meetings to understand the needs of the people living near the pipeline. “We’ve had a lot of engagement, and it’s been a very long process,” she says.